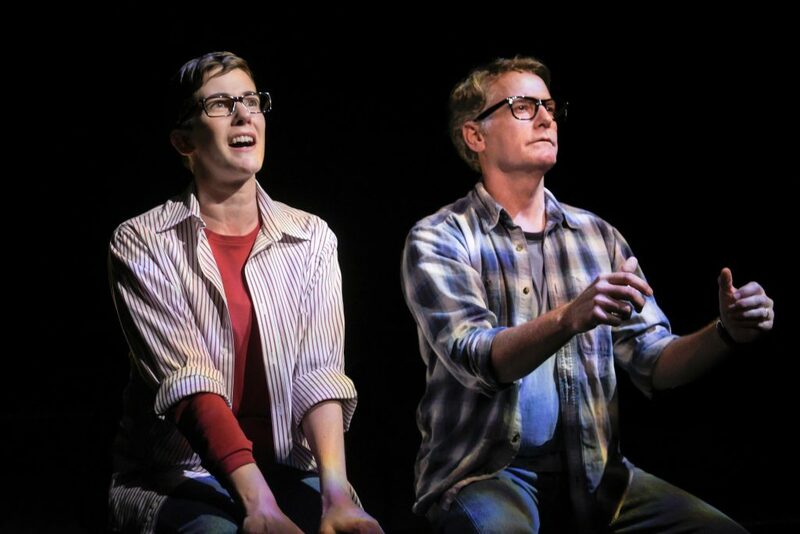 “Fun Home” opens on a solitary artist’s drawing board in a vast, dark space. Graphic novelist Alison Bechdel casually strolls in and begins to reminisce about her troubled childhood in a funeral home. 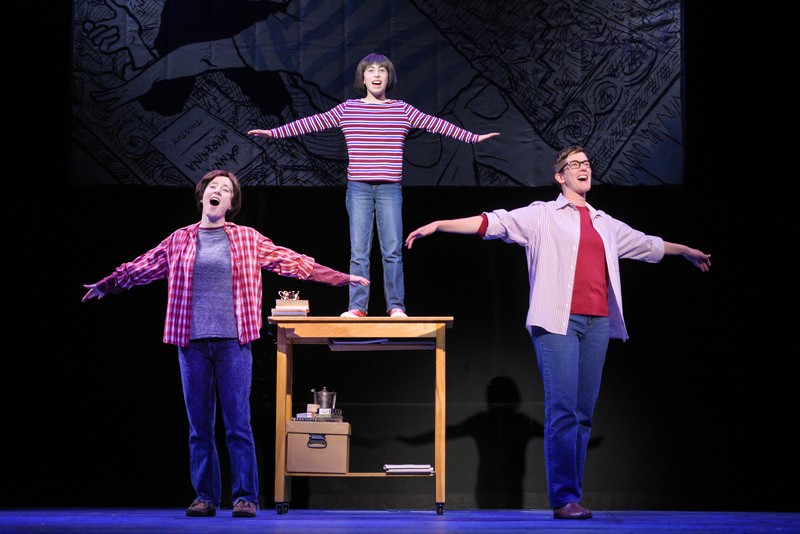 Winner of five Tony Awards, including Best Musical, “Fun Home” brilliantly depicts Alison’s awakening lesbian sexuality, her father’s suicide, and the effects on her family. Scenic designer Andrea Bechert creates a magnificent mansion, with sumptuous red velvet couches and an elegant library. 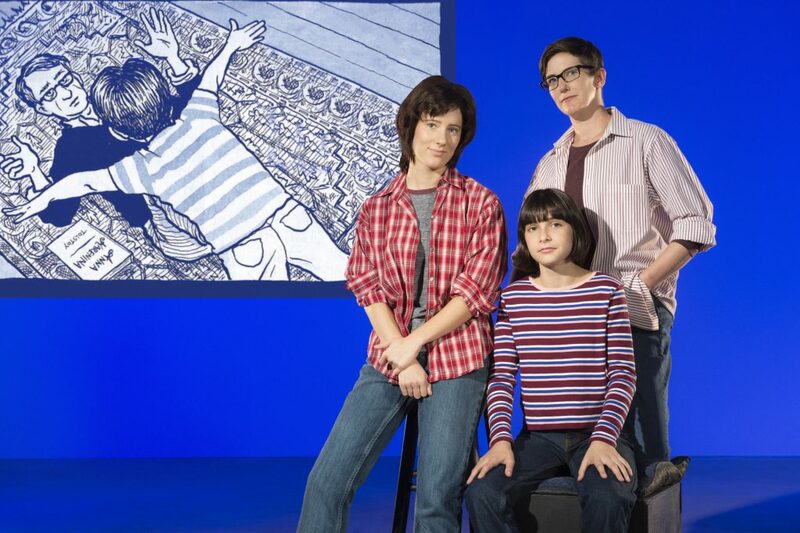 Bechdel’s graphic novel follows her as Child Alison (charming Lila Gold), College Alison (hilarious Erin Kommor), and Present Day Alison (captivating Moira Stone). All three Alisons brilliantly act and sing about growing up with her tortured, closeted father Bruce (captivating James Lloyd Reynolds). Dad remodels and fussily redecorates their “perfect,” antique Victorian house. Bruce also gets his daughter to help with autopsies as a part of the family business—really a FUN-eral home. 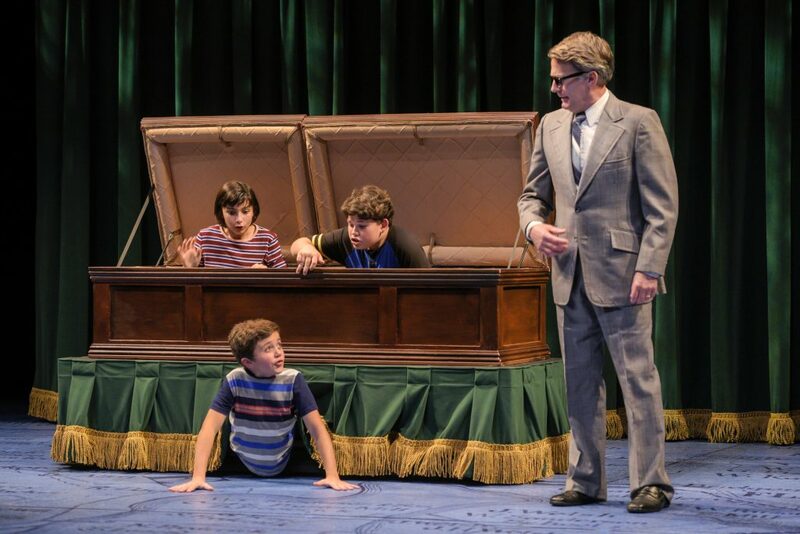 The innocence in the song “Come to The Fun Home” leaves us laughing, as Alison and her trouble-making brothers Christian (phenomenal Jack Barrett) and John (adorable Oliver Copaken Yellin) make funereal fun of the family business. They create a fantasy commercial with the kids jumping out of caskets and dancing over wreaths of flowers. It’s dark humor at its best, with top-notch singing and dancing—best I’ve ever seen. When College Alison sings “Changing My Major to Joan,” we feel her joy at discovering sexuality. College Alison’s first sexual encounter with in-your-face butch lesbian Joan (talented Ayelet Firstenberg) enchants. Alison sings and dances around a sleeping Joan, proclaiming her love, studying Joan’s well-sculpted body, and speculating on secrets between her thighs. Yet, we are constantly reminded of Bruce’s unhappiness, which seeps out and becomes Alison’s trauma. We see Bruce’s cringe-worthy attempts at seducing young men. His wife Helen (amazing Crissy Guerrero) sings about meeting Bruce’s past lovers and protecting him from mean small town gossip. But Bruce throws fits of anger at his wife Helen, evoking poignant, enlightening moments. Well-deserved awards all round: Jeanine Tesori for stylish music, Lisa Kron for sprightly lyrics, and Alison Bechdel for her superb graphic novel. TheatreWorks masterful director Robert Kelley makes them all immediate, exciting, and transcendent. 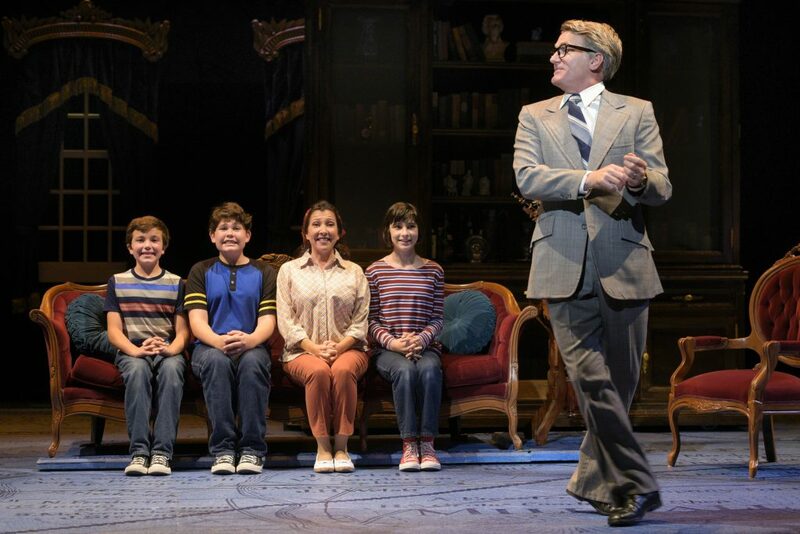 “Fun Home gives us a taste of a closeted gay father’s life, and insight into the power of love. Truly, a special musical—with zippy tunes—to see more than once. Cast: Jack Barrett, Dylan Kento Curtis, Michael Doppe, Ayelet Firstenberg, Lila Gold, Crissy Guerrero, Billy Hutton, Ruth Keith, Erin Kommor, James Lloyd Reynolds, Moira Stone, and Oliver Copaken Yellin. “Uncle Vanya”—A Vibrant Cage Match of Discontent, at Cutting Ball, S.F.